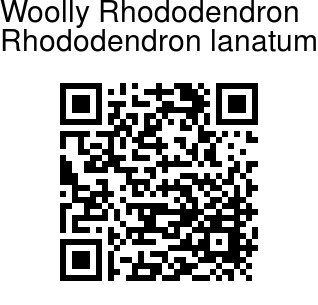 Woolly Rhododendron is a shrub 1-3 m tall with young shoots and leaf-stalks densely whitish to tawny woolly-velvety. LEaf-stalks are 1.0-1.5 cm, leaves leathery, elliptic to obovate or oblong-obovate, 6-11 x 2.5-4.5 cm, base obtuse or broadly wedge-shaped, margin curled, tip blunt or somewhat rounded, apiculate. Lower surface is white, densely pale chocolate brown to rufous woolly, hairs crispate dendroid. Upper surface is hairless glabrous except for groove of midrib, midrib and lateral veins prominent below. Flowers are borne in clusters which are racemose-umbellate, 5- or 10-flowered, rachis 3-10 mm, woolly-tomentose. Flower-stalks are 1.5-2 cm, densely whitish to tawny woolly-velvety, calyx 1-2 mm, velvety or hairless. Flowers are broadly bell-shaped, sulfur-yellow, with red spots, 3.5-4.5 cm, petals 5, rounded, emarginate. Stamens are 10, unequal, 1.5-2.6 cm, filaments pubescent at base. Ovary is 5-lobed, about 6 mm, densely tawny-tomentose; style about 2.6 cm, hairless, stigma lobulate. Capsule is elongate-cylindric, slightly curved, 15-25 x 4-8 mm, velvety. 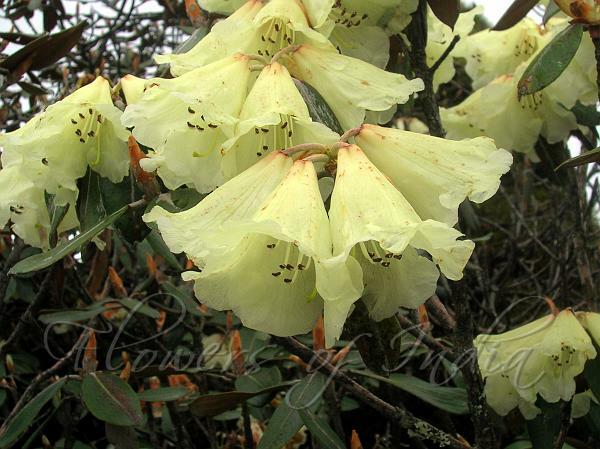 Woolly Rhododendron is found in coniferous forests, Rhododendron thickets, and mountain slopes of Eastern Himalayas, mostly in Bhutan, Sikkim and Arunachal Pradesh, at altitudes of 3100-4400 m. Flowering: May. Identification credit: Bharat Kumar Pradhan Photographed in Tawang district, Arunachal Pradesh.